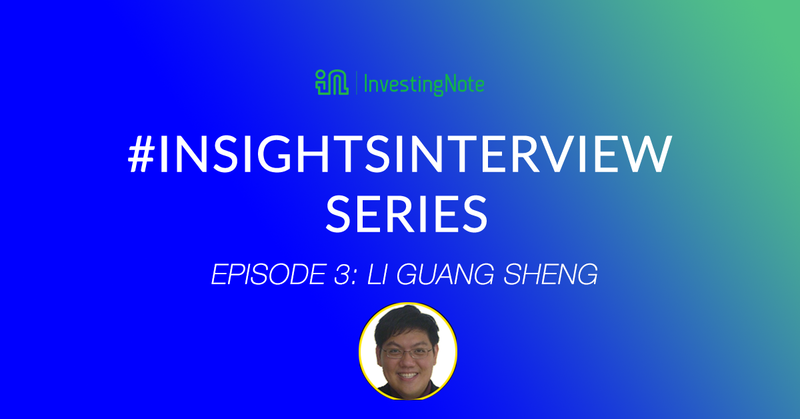 This week, we sat down with Guang Sheng on a weekend to understand more about his investing strategies, his investing “idols” and what motivated him to get started in the first place. I just loved the numbers! I discovered that I had the gifting for numbers and probability in my younger days. Somehow by looking at them, my brain would be able to process them, and I could easily predict the event happening and outcome. I chose Economics in my university days, as I was fascinated about how data can help us understand the world and make predictions about what lies ahead. Although economics is a great discipline, I guess when it comes to business and money, it just resonates effortlessly with me. What is the most extravagant thing you have done in investing? One of the most effective ways to know if the company is doing well is to be a part of it. I took up MLM(Multi-level marketing) membership in Best World to see for myself whether the products and MLM payout system are that good that people are yearning to join them at that time. I took my time to observe and interact with fellow MLM members and staffs. I was impressed with their China and Taiwan expansion plan and good management staffs that was put in place to grow these two markets. At the end of this study tour, I was thoroughly convinced, and I know the growth is going to be massive. I enter a significant position in this stock before the company grow their Taiwan and China market and in a short span of time, the stock rally more than 200%, and I made great profits out from this. I exploit stocks that are mispriced due to corporate actions. Therefore, it is essential for me to understand how a particular corporate action is going to affect the companies, which eventually may impact the stock price. Starting phase was tough as to understand those corporate actions and how it would impact the stock price takes time. I need to do backtesting, correlation study and it took me years. Once I gained the experience, finding the right stock to invest become easier. Can you describe how you get started in stock investing? My dad and mum got me interested. My dad gave me money to invest under his stock account in the 90s. The first stock I bought was Pacific Carrier Limited which got delisted. I study the financial and purchased the stock. My dad taught me a lot especially on arbitrage opportunities and psychology in stock trading. On the other hand, my mum lost a lot dabbling in the stock market and was bankrupt twice, but due to her stock dabbling, I learned a lot from her, more on her mistakes as she lost millions and I told myself never to speculate like her nor repeat her mistakes. Indeed, when times are good, both my dad and mum make good money in the stock market, and this got me hook up and got interested studying the stock market. In fact when I was young, I aspired that one beautiful day, I can also make good money consistently in the stock market by finding the winning formula. Is there any particular investor(s) or author(s) who have had a significant influence on your investment thinking? (Regarding saying mentoring or inspiration)? What do you think of the current market conditions right now? Right now, the world’s attention has mainly been focusing on the raising of interest rates in US and the trade tension between US and China. I expect growth to continue. However, market volatility will rise, and I believe in times like this presents great hidden opportunities. Which sectors of the stock market should investors look at and avoid? With a few more rates hikes expecting in 2018/2019, I favor banks as we continue to ride on the Net Interest Margin improvement in 2018. I expect oil prices to trend higher, and it will drive oil majors’ CAPEX and stimulate offshore activities. I favor offshore and marine sector. I avoid REITs as interest rate rise will affect its overall bottom line. There are very few investors who have been as successful as you. What gives you an edge in the market? I believe that if I use the strategies that most people use (FA, TA) then, I probably will get the results that most people understand. Don’t get me wrong, I not saying that FA/TA are not good. As I am involved in many corporate deals, I met many millionaires and billionaires. The way they look and analyse things are different. So over time, I can view items from another perspective and eventually when things started to unfold, I could understand how the Big Boys operate. In reality, no one throw in good money to lose, be it funds or high net-worth. Also, it is the reality that ‘Big Fish eat small Fish,’ so to survive; I have to think like a Big Boy. I might not have the resources like them, however, if I can feel and think like them and if I am able to predict their move, I should be able to take a step earlier and ride together with them. This involves complex game theory as I use economic game theory to analyse. What’s the logic behind using corporate actions to invest in a particular counter? It falls on the universal principle of cause and effect relationship in which an event (the cause) makes another event happen (the effect). Let’s look at the recent earnings (Q2 2018) announcement on Facebook. The stock price dipped as much as 24% (effect) after the report announcement (cause). Likewise, a corporate action is an event (the cause), and this will make another event happen (effect). Right now, I am going to share a secret to you, if you know understand what these corporate actions are and the rationale behind it, you can seize the opportunity and capitalize on these corporate actions to your advantage and make good profits. How did joining the rotary club help you in your investing journey and what have you learned from your network? I met many successful and wealthy individuals, and I was fortunate that they are willing to share with me their successes and failures in investing. They shared valuable experience for me to tap into where they have ‘been that, done that.’ One example was from the late PDG Dr. Ben Chng, who taught me how to invest in property. He showed me that when it costs more to build the wealth than current valuation, is 100% undervalued and is time to buy into property or property stocks. I have also seen a lot of close friends in Rotary who retire early in their early 50s due to stock investment. They are my idol and they taught me a lot. The key shares that contribute to their early retirement are SGX, Reits and Starhub. You look at virtually almost all the shares in SG, and talk to investors and insiders on their opinion of the shares if 70% everyone is bearish about a stock, what do you do? Everybody has a right to formulate his or her view and opinion. As every one of us has our investment objectives, time horizon, risk tolerance, price target, etc., it doesn’t change much of my position unless I think this is a vital piece of information that could affect the entire game plan. Lastly, how are you planning for retirement? I do not think I would ever retire as I am enjoying every moment of my time. I am currently actively contributing to the Rotary organization and probably start to think about that when my son becomes independent (he is five right now). Money is never enough, and the more I accumulate early, the better would be my retirement life. The cost of living in Singapore is getting higher so we must work harder and smarter to grow our money. Li Guang Sheng currently has more than 4,500 followers and 2nd most influential user on social media. Follow him to get the latest updates and insights on the Singapore stock market. He is also an exclusive provider of premium analysis on Corporate Actions in our Investors’ Marketplace. For more juicy analysis and personal stories by financial influencers, check out our previous episodes on #InsightsInterview with Terence, founder of TUBInvesting and James Yeo, SmallCapAsia.